Afghan Duck And Cover: A Reporter's Dilemma : The Two-Way The debate over whether to take cover or do my job is one I have frequently here in Afghanistan. Like I did today as I and some of my Afghan and Western colleagues left the peace jirga tent in Kabul. 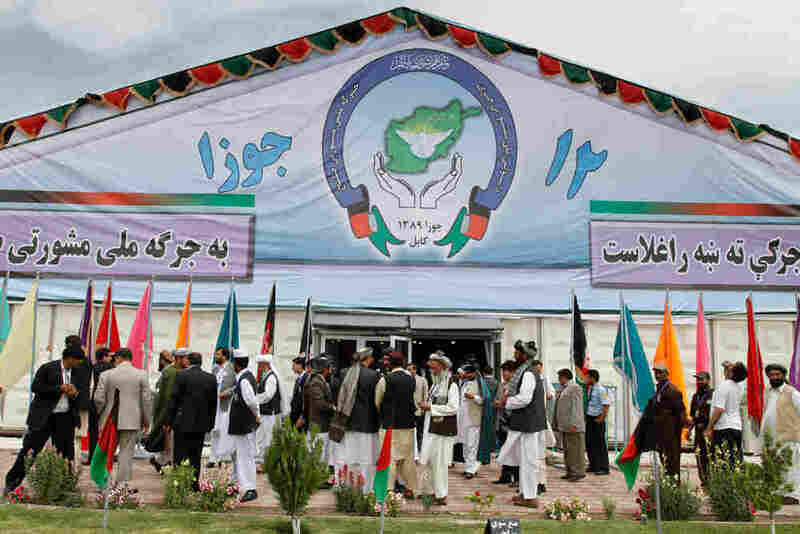 Delegates leave the peace jirga tent after hearing sounds of a rocket attack, in Kabul, Afghanistan, Wednesday, June 2, 2010. The debate over whether to take cover or do my job is one I have frequently here in Afghanistan. Like I did today as I and some of my Afghan and Western colleagues left the peace jirga tent in Kabul. The jirga is an assembly of tribal elders, local leaders and other notables who traveled here from across Afghanistan. Their task is a daunting one -- To come up with ways to persuade Taliban leaders and fighters to stop the war and rejoin Afghan society. That the militants chose to attack the gathering with rockets and suicide bombers made it even more interesting. Hence my fuming. I'd missed recording the first rocket the Taliban fired because I was too busy jostling with cameramen for a good spot from which to record inside the jirga tent. So from that point on, I vowed to just let the recorder keep running, even for the sweaty and dusty, 20-minute trek to the media center. The Taliban didn't disappoint. A few moments later, the militants fired a second rocket, which sent most of my colleagues to the ground for cover. I, on the other hand stood in place, holding my big furry mic up high as the rocket whooshed overhead past the jirga tent and slammed into the nearby mountainside. I wasn't being brave or stupid. I knew from the second I heard the rocket that I wasn't in danger. Our security consultant here in Kabul agreed. "If you hear it whoosh, it's already passed." The delegates weren't quite as comforted. Some, like women's rights activist Orzola Ashraf feared if the militants keep firing rockets, delegates won't be able to get to the tent to finish their work before the conference ends Friday.